I just don't get what the typical go fast boats are all about. Before the owners of these boats start to whip me with their gold chains, I get the "Need for Speed", I just don't get these boats. I would love to have the "where with all" to own a fast car, and when I say fast, I mean fast as in a Bugatti Veyron, or a Aston Martin DB9. Now imagine what the DB9 would look like if you asked Aston Martin to design one, that would go just as fast, and have room to sleep in it at night, (maybe this would be a good topic for Top Gear), and the typical go fast boat is what you end up with. So here is my impression when I get on a generic go fast boat. You enter, often precariously, into a cockpit that is generously covered with copious quantities of colorful hides, from the rare Nauga. Stepping down into a cabin designed for Hobbits, onto a purple plush carpet, and with bent knees, and a cricked over neck, you survey the less than expansive space. A galley is to port, with a fridge that will just hold a couple of bottles of wine, and maybe a six pack of beer, and a sink that is just large enough to ice down a bottle of wine. To starboard, is a tiny claustrophobic compartment that has a head, and another pretend sink. Lifting your eyes forward, is a very low white pleather couch, facing a formica cabinet, with lots of mirrors above it, and plenty of gold plastic trim. The "Piece de Resistance", all the way forward is the love nest. A triangular bed, with a leopard print bedspread, that you can barely crawl onto on your hands and knees. With poor access to the bow, often no anchor locker, loud, poor ventilation, and hard riding, they are a classic case of function follows form, with marginal accommodations, and garish interiors. Ouch, quit hitting me with that gold chain, your'e going to break it. I feel better now that this is off my chest, but all of a sudden, a new go fast boat moves into my town, and all of my perceptions are suddenly changed. The boat below is the new Nortech 80 Roadster. This is a deceptive vessel. At a first glance, it appears to be just 40 feetesque long, but when you get up next to it, it's substantial in scale. With a length of just shy of 80', and a beam of 16', I feel small next to it. A huge cockpit, and a very commodious European style interior, with a three cabin layout, that sleeps 6 in comfort. There is a full galley, and en-suite heads for each cabin. It is everything its little brothers from the Jersey Shore want to be, but never achieved. The Roadster has twin Cat ACERT turbocharged diesels providing a total of 3800 HP, powering Arenson surface piercing drives, and reaches speeds of over 70 MPH. With a displacement of 80,000 pounds, and 1200 gallons of fuel, you will get a smooth ride, over a much broader set of sea conditions, and with real range. Also unlike its little brothers, the helm can hold real navigation systems. In this case there are twin Garmin 5215 15" touchscreen chart plotters, and most clever of all, the Garmin radar dome rises up out of the cockpit on a stainless shaft to a usable height when you need it. So lets sum up, very fast, comfortable, room for real navigation systems in the dash, and a real head turner. I have seen it out on Sarasota Bay at speed, and it an awesome beast to behold. Best of all, no purple plush carpet, and monkey fur to be seen anywhere. When I took the pictures, I was also very impressed with the lift, and maybe in my slightly weird techie way, I liked the lift more than the boat. The lift is a Titan 60 ton precision machine manufactured by Quality Boat Lifts in Ft Myers Florida. I spoke to Sean, who was the engineer that designed it, and the lift, like the Roadster, is a machine on a grand scale. The system uses 220 VAC stainless steel variable frequency electric motors, with cycloidal gearboxes to drive the lifts. With next to no mechanical backlash, the programmable speed controlled system, allows the lift to start smoothly, accelerate to speed, and then gracefully brake to a stop. This type of drive system is also used widely in larger robotic systems. In other words, this lift will place the 80,000 Roadster exactly where it is supposed to be, stop on a dime, and give you nine cents change. The motor covers are powder coated aluminum, and Plexiglas windows on the sides allow you to see the drive systems. In addition to the 60 ton unit, there are also 50 ton, and 36 ton systems, and all are available with a wireless interface, and a remote controls. You need to pick up a big boat? This is where you should go. 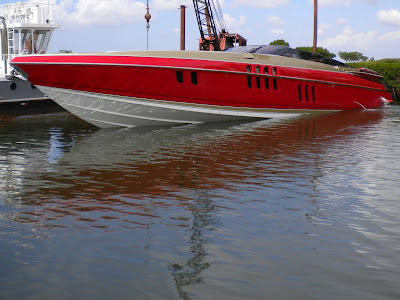 The Roadster, has temporarily left town, and can be seen at the Ft Lauderdale boat show, and if I can catch up with the owner, we will come back and take a closer look at this remarkable piece of boating technology. Now come on now all of you gold chain wearing guys, you know you really want a Roadster, so stop beating me with those chains, the Atocha coins are staring to hurt. It's a cool and blustery October day on the Alligator-Pungo River portion of the ICW in North Carolina. Captain Ralph Robinson feels a bump, and a vibration that felt sort of like a grounding, but nothing serious. 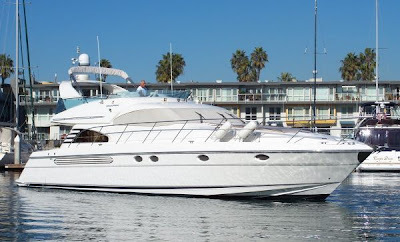 The boat tips to starboard, and then turns to port, just as the port engine goes to maximum rpms, and almost instantly all three bilge pump indicators light up on the dash, and the high water alarm starts to ring as well. He jumps up from the helm, runs to the aft of the bridge, looks down at the swim platform, and sees water just starting to come over it. The boat is already now 12” lower in the water, and he instantly realizes they are sinking. He, and his mate Jay Huber run down the stairs to release the tender that is strapped down on the swim platform. They get one of the three straps released, and they are now standing in knee deep water on the platform. The tender is being dragged under by the swim platform, and the tension on the other straps is now too great to release them. Ralph asks Jay to go up to the bridge, and get the handheld VHF at the bridge station, and the latitude longitude position as well. Looking into the closed sliding glass doors leading to the main salon, he sees water rising up inside them, and a geyser of water boiling up in the center of the main salon some eighteen inches high. Ralph said of the moment, "Mental confusion abounds, and trying to make any sense out of this situation only slows our decision process". Ralph deploys the emergency life raft right on the aft cockpit deck, just as the water starts to pour over the sides of the aft deck coamings, and scrambles into it. Hanging onto the bridge stair's railing as the yacht sinks, he maneuvers the life raft over to the port side, going from hand hold, to hand hold, using various parts of the boat, he keeps the raft right next to the boat at about amidships. As he nears the bridge of the quickly sinking boat, he calls to Jay to give him the VHF, and the latitude longitude numbers. Jay hands Ralph the VHF, and advises him of the ships position. Ralph remembers his cell phone is on the console of the bridge, and asks Jay to retrieve it. Just as Jay grabs the cell phone, the sinking accelerates, as the boat loses all buoyancy. Water starts to pour over the bridge side coamings of the boat, which is sinking aft end first. Jay is now already nearly waist deep on the bridge, and desperately tries to reach the raft, but the force of the water rushing over the bridge is too much to overcome, and Jay is carried down with the boat. Jay tries to swim to the surface, but strikes the bimini top, over the bridge and is disoriented for a few seconds, before he gathered his wits, and swims out from underneath the bimini, through its support tubes to the surface. Ralph had been fearfully searching around, sees a hat, and grabs it, but no hair is attached to it. About fifteen very long seconds later, Jay surfaces, and Ralph drags a very cold, and wet colleague into life raft, and out of the 58 degree river, partially filling the raft with water in the process. In just 120 short, and adrenaline driven seconds, about the time to took you to read this far, Ralph, and Jay went from sitting comfortably on the bridge of a 59' Fairline Squadron yacht, to squatting cold, and wet in a life raft that was floating in a desolate portion of the ICW adjacent to the Dismal Swamp in North Carolina. They had no ID's, no money or credit cards, and only the very cold wet clothes on their back. The boat was now completely gone. The VHF handheld radio was used to place a Mayday call to the Coast Guard. It was answered by the Norfolk USCG station, via repeater stations, located about 75 miles away. Ralph is very concerned about Jay's condition, who is now suffering from hypothermia, and is so cold he can't even speak, and requests that a helicopter be sent for Jay. The USCG radio operator starts to ask questions, some of which, Ralph cannot answer, such as what is the owner's address in London. The radio operator insists that no bird can be sent for Jay, until all of the blanks on the form are filled out. Ralph does not know some of the information the Coast Guard is asking for, and the radio operator will not dispatch the bird without it. Despite many requests, the radio operator will not let an increasingly frustrated Ralph talk to a supervisor. The nearly twenty minute radio impasse is ended when the bow of a local crabber's boat nudges the tented life raft. The crabber had spotted them floating, picks them up, covers Jay with a coat, and takes them to Belhaven North Carolina. The last radio contact with the USCG, was the call Ralph made to advise them that a local boat had picked them up, and took them to Belhaven. The USCG radio operator just advised Ralph there would be an investigation about the accident. On a Sunday, just three days before the accident, a sailboat was traveling in the very same section of the ICW, noticed day marker 15 was missing, hailed the USCG on the VHF, and reported it. The USCG logged the call, but did nothing. No "Securite" announcement was made, and no further investigation was persued. The following Tuesday, Ralph was approaching the missing marker, and he was puzzled. The marker was showing on the Furuno chart plotter, well off to his starboard side, but there wasn't a marker visible. What had happened was the day marker number 15 post was made of large welded pipe sections 12” in diameter, and a barge, or some other vessel had struck the marker sometime before the accident. With the top portion of the marker broken off, the remaining open pipe post, lay hidden just a couple of feet underwater. The marker post was actually located over five hundred feet away from its charted location, and this was verified by the insurance carrier. The 50,000 lb Fairline yacht impacted the mis-charted submerged post at 22kts. When the yacht hit the top of the pipe at amidships on the port side under the Master Stateroom, it cut away a 12" wide, by 10' foot long strip of the hull like a potato peeler, and forced it down into the pipe. Along the way, the pipe struck the oil pan of the port engine, ripping it free of the engine mounts, and propeller shaft, forced it upright, and drove the engine through the floor into the main salon. Free of the shaft loads, the now holed motor spun up to its maximum rpms, and then quickly, and traumatically failed. Within seconds, the gaping hole had flooded, the engine room, and the boat was now rapidly sinking. Belhaven North Carolina is a small town located near the mouth of the Pungo River, and is eight miles from Pamlico Sound. Another 15 miles carries you to North Carolina's Outer banks. A soggy, and cold Ralph, and Jay were dumped off at the River Forest Manor, and Marina Shipyard, and looking like a couple of homeless guys, told their story to Axson Smith the owner. Axson immediately dug cash out of his till, and had an employee drive Ralph, and Jay to a local store, where they were able to buy some new dry, and warm clothes, and provided rooms for them at the River Forest Manor, which is also owned by Axson. There is a round of many phone calls made to inform the owner in London, and to arrange for replacement ID's, credit cards, and cash. Getting new plastic for the now non existing wallets would take several days in this remote area, and much to both Jay, and Ralph’s pleasure, and surprise, three of the local restaurants offered to feed them on the house. The hospitality provided by the residents of Belhaven, to a couple of shipwrecked visitors, was amazing and heartwarming. The boat was salvaged, albeit with some struggle. Divers attached lines to the bow of submerged boat, and towed it about a mile, leaving the bow out of the water on a sand bar. Working in the shallower water, and using plywood to close the large rent in the bottom, the boat was raised on the following Saturday, and towed afloat to River Forest Shipyard, where it was hauled for investigation by USCG, NC Wildlife officers, and Lloyds of London. The initial suspicion by the investigating groups was that the vessel must have run over a standing marker, and the captain was negligent. This notion was quickly dispelled, and Ralph was completely exonerated, when everyone could see the condition of the bow, which was without a scratch, the location of the actual hole in the bottom of the boat, and the fact that the day marker was not located in its charted location. At the time of the salvage, a strip of the boats hull was still visible stuck inside the underwater marker's pipe. The insurance company requested, and received a copy of the USCG VHF transmission recordings. The recordings included the call by the sailboat reporting the marker missing at least three days prior to the accident, and also included Ralph's unsuccessful twenty minute VHF Mayday call requesting help. The insurance company filed a request to sue the USCG, and very shortly all matters were promptly resolved. Two senior USCG officers, in full dress whites, drove down from Norfolk, and personally apologized to Ralph, for the now removed VHF radio operator's actions, and averred that this is not the way they normally do business. The owner was given a check for the full replacement value of the boat by his insurance company. Ralph has made a small change to his equipment inventory when he travels now. This consists of a waterproof "Jump Bag" he bought from West Marine. His original jump bag was not waterproof, and was in the main salon. In the new bag is a handheld VHF radio, Raymarine RC400 GPS chart plotter, cash, credit cards, and a Spot satellite GPS messenger. The bag is always close at hand now. Relying on the kindness of strangers is nice, but being even more prepared, is priceless. I have known Ralph, for many years, and of all of the captains I have dealt with, Ralph is the most competent, and professional of the lot. His story is remarkable. A sinking ship, refusal by the USCG to provide aid, warm hospitality, and assistance to total strangers from the residents of Belhaven NC, and most of all, how your life can be dramatically changed, in just 120 short seconds. Maybe all boaters owners should take a couple of minutes to inventory their safety gear, and mentally run through what you would do, if this happened to you. The photographs of the salvaged vessel were graciously provided by Axson Smith, the owner of the River Forest Manor and Marina. This is a good place to stop on your travels down the intercoastal waterway. The photo of the Pongo river is from the blog Scooters Voyage. You can learn more about picturesque Belhaven NC here. "That ain't going to grow back, it's broke, it's done, no glue or goo will fix it, did you really look closely at it?, and that is my professional opinion." This is my pronouncement as I look at the transducer while the boat is on the forks of the lift. The damage is the result of an untimely meeting of the transducer, and the wood bunk of a storage rack. Ah the miracle, and power of misapplied hydraulics. The boat, a middle aged 30'esque Searay had a Raymarine system, and I instantly knew what transducer was needed. This unfortunate event occurred in a condo high and dry marina facility I often work in, and given the obvious mortification of the lift truck driver, I said I would do the replacement of the transducer at no charge, if the marina purchased, and paid for the materials. Karma is a wonderful, and cosmic thing. So a few days go by, and the new transducer shows up. A local mechanic friend is there, and he comes over to give me a hand. I open the engine hatch, and stare down into a compartment which is dominated by two huge engines. I squeeze myself into a space that was never meant for human occupation, and doing a sort of awkward half hunched kneeling thing, I reach down, and feel around for the nut of the bolt that holds the front end of the fairing block in place. Much to my chagrin, I can't find it, it's just not there, and I also feel a in-hull transducer mounted right next to the broken transducer. I wriggle back out, dragging my wrist across a sharp edge of a tie wrap (Inset your favorite expletive here), and cut myself in the process. I take Plavix, (a price I pay for earlier lifestyle indiscretions), and any small cut instantly looks like a gunshot wound, and sends onlookers fleeing in horror. Out to the truck I go, and with some liquid bandage, and waiting the sixty seconds for it to dry, I'm back in business. I climb under the boat to stare again at the transducer, and realize I missed something when I first looked at it. Among all of the carnage, I didn't notice there wasn't a bolt installed in the front of the fairing block. 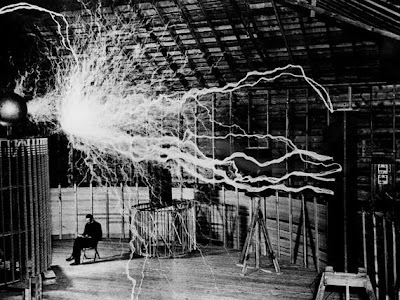 Look at the picture above at the triangular area, and you can see it's missing, and worse, it was never there at all. Who ever installed the transducer mis-measured where to drill the two inch hole, and the bolt would now be forward of the engine room bulkhead, in an inaccessible area under the fuel tank. The good news is they didn't drill the hole at all in that location. The bad news is the bolt's job is to stop the fairing block from twisting at high speeds, and causing it to leak. The installer's solution to the problem was to apply copious quantities of 3M 5200 everywhere to keep it in place. The transducer still has to be removed, but the access to the big nut in the engine compartment is so limited, I can't break it loose, so out comes the angle grinder with a cut off wheel, and twenty minutes later it's history. A few minutes later all of the goo has been has been removed with an assortment of sharp implements. Now it's time to talk to the owner about the problem. 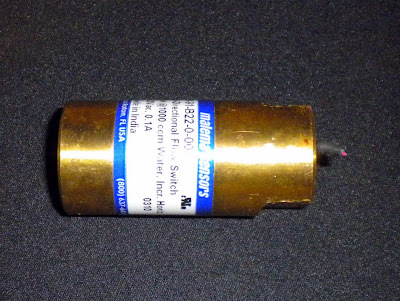 I don't want to install the new identical transducer, for obvious reasons, and my solution is to replace it with a low profile tilted element transducer. No bolts, much harder for the fork lift operators to break, it will cost less, and all will be better for everyone. A marina staffer dials the number, hands me the phone, and everyone retreats. Hi, I'm Bill, nice to meet you, this is the problem, and I think this is what we should do, no it won't have a paddle wheel, but you won't miss it, no SOG does not come from the paddle wheel in a Raymarine system, in the Raymaine system you only see paddle wheel "Speed" in a data box, and you don't currently have one set up, I'm sorry, but I didn't install it, this is really a better solution, no the transducer is made by the same company, and I can get one on Monday, you're doing a burial at sea on Sunday?, and you're going on a trip Monday that has been planned for weeks?, can't cancel the reservations?, but you have depth from the other transducer, the problem is that you are running both transducers at the same time, and they interfere with each other, and on and on we go. The owner is really a nice guy, on the phone at least, but I have not met him in person. In the end, I took an old Garmin transducer I use to test sounder modules, and installed it, to plug up the hole so the boat is usable. The owner will advise me when the boat is back from the long planned trip, and that boat had better be used on Sunday, and gone on Monday. I write, I eat, I deal with marine electronics, and I'm hungry for more. I install transducers in boats with "No Reservations". The lines above are a small homage to Anthony Bourdain's "No Reservations" show on the Travel Channel. I love his writing style. The mix of both witty, and cynical ennui, with an almost childlike exuberance for all things pork, is most clever. His show is one of my favorites, and you can find his blog here. 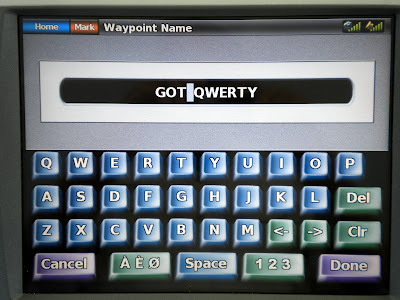 Christmas in October, Got QWERTY? 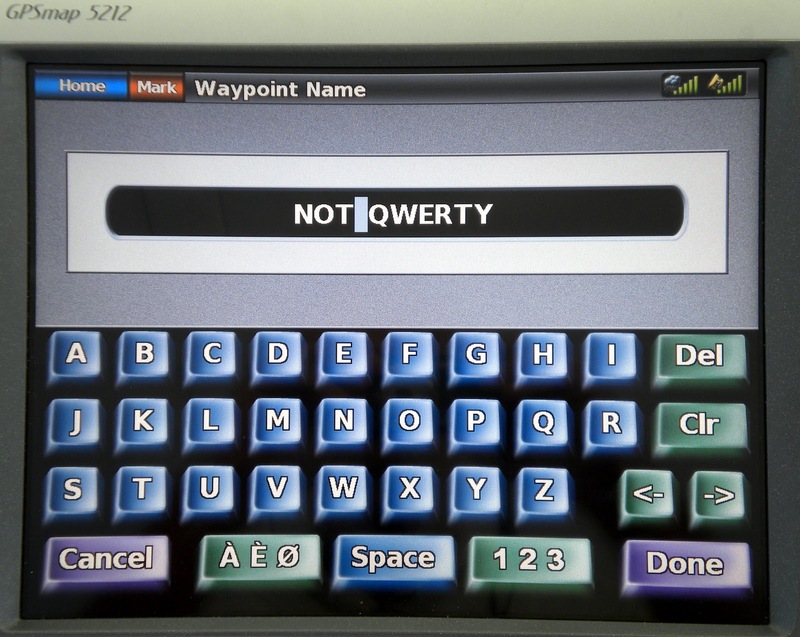 "From Garmin I would like a QWERTY keyboard for the marine touch screen units. 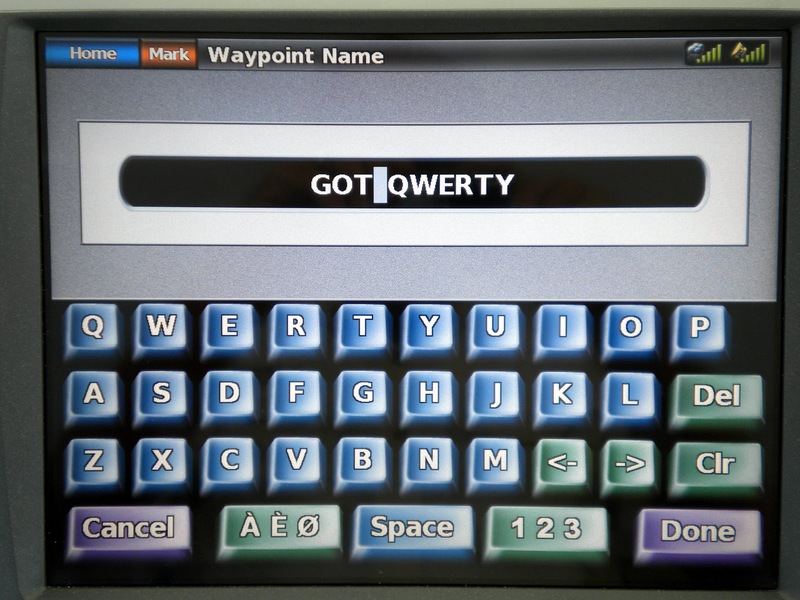 It drives me crazy trying to use the linear keyboard, and doesn’t make me feel smart. 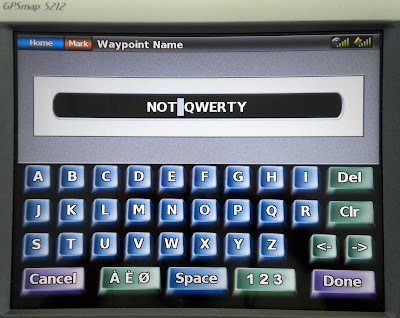 I’m sure the programmers wouldn’t want to use a keyboard like that at work." 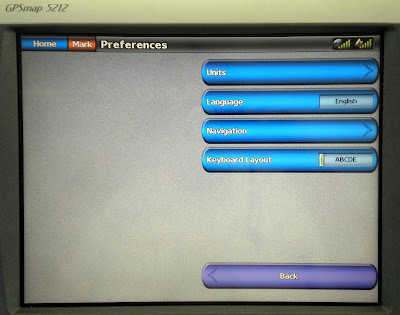 To Home/ Configure/ Preferences/ Keyboard. Now I didn't cause the change to be made, but I was most likely the most vociferous, and persistent voice out there asking for this item, and I am delighted to see this change. There are other good system improvements, in this upgrade, so check your software status when you start up your 5000 series system, and if you are not at 6.1, get the free software from the Garmin website, or have your local installer fix you up. I do this for free for all of my clients upon request, as long as they are geographically attractive. When you notice that your equipment manufacturer, has stopped investing in software upgrades, and improvements, it is a sure sign that the product is going to turn into a buggy whip. Christmas is just around the metaphorical corner, and I will have a new list of things I want in my stocking, and I want a little less coal this year. To tape or not to tape, that is the question. A goo vs tape analysis. I was asked to make a service call to replace a field diagnosed problem with a Garmin auto pilot shadow drive. The shadow drive is unique to Garmin's autopilots, and its job is to detect that the helmsman has taken control of the vessel by detecting movement of the helm. When it senses helm movement, it immediately disengages the autopilot, and gives full control to the helmsman to do some task like steering around a lobster trap buoy. After a couple of seconds with no helm movement, the auto pilot will request permission to re-engage, and place the vessel back on course. It is both clever, and easy to use. 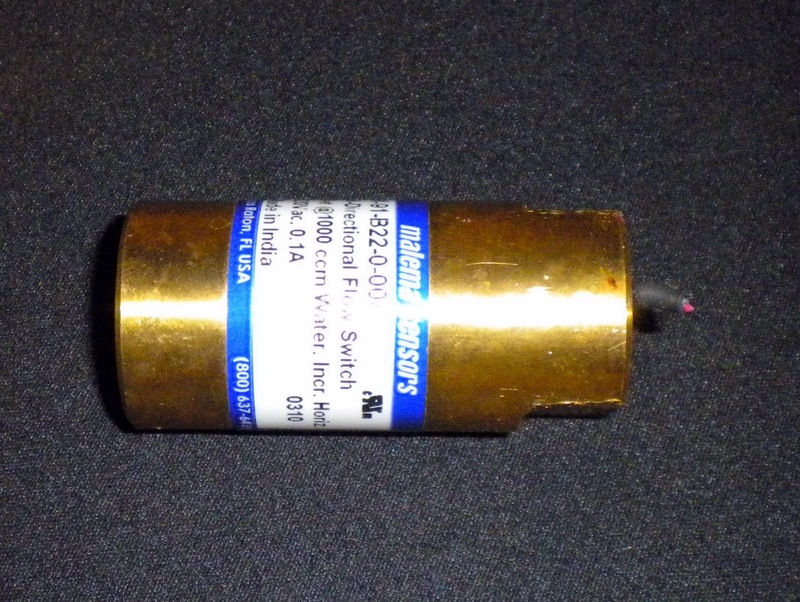 The initial problem report was that a hydraulic pipe fitting had been screwed into the end of the shadow drive so tightly, that it had damaged the sensor's wire where it passed out of the brass case, and it sure looked that way when I first saw it. 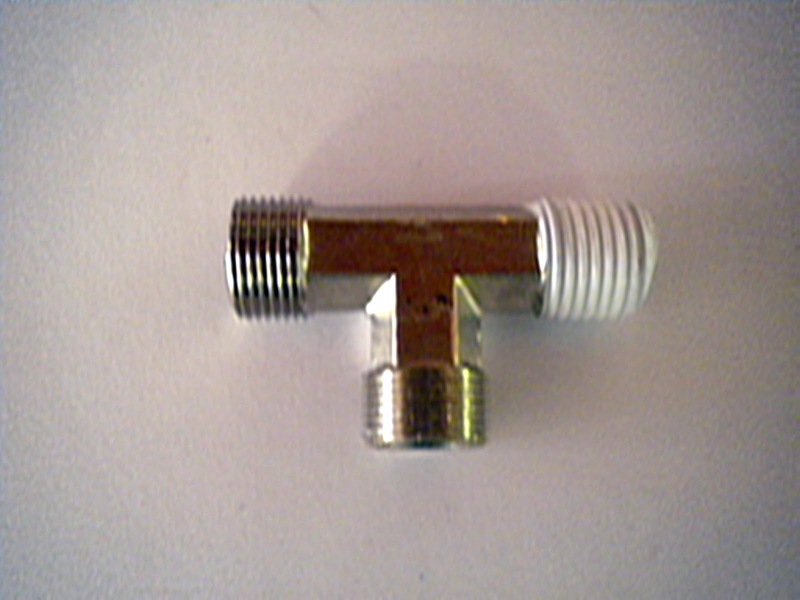 The fittings that screw into each end of the shadow drive are 1/4" NPT standard pipe fittings, and are often used in hydraulic steering systems. 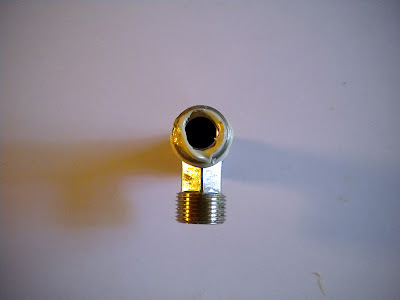 Armed with a lot of rags, and some wrenches, I try to unscrew the fittings but criminy, the fittings aren't moving. So back to the truck I go for some bigger wrenches, and with more effort than I would have ever thought I would have needed, they finally unscrewed out. I finally free the little beastie, and staring down inside the shadow drive, I find a wad of Teflon tape inside. This is the real culprit. 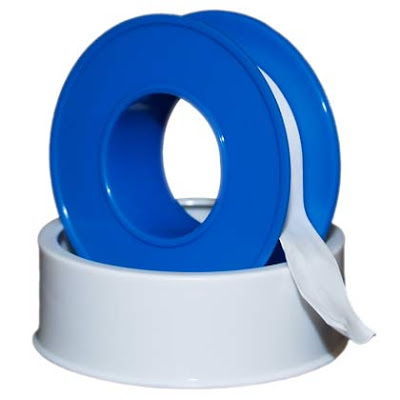 Your boats steering system does not like any foreign materials that will find its way into check valves, ports, steering pump parts or the ilk, and this wad of tape was a problem. After examining all of the evidence at hand, I was able to logically determine that this problem must have been caused by a "Roid Raged" professional weight lifter, with a serious teflon tape fetish issue. I know this because even the Mercury hose fittings, that do not need tape or sealers at all, had tape on them. In a few minutes the new shadow drive was installed, and the system works now perfectly. I have mixed feelings about hydraulic pipe thread sealing systems. They do two jobs, the first of which, and most importantly, is to lubricate the threads, allowing the fittings to screw down further, and the second job is to provide a seal for any spots where fluid can escape. In theory, and it is theory, perfectly machined NPT pipe threads on both parts will not leak, if they are tightly enough screwed together. The reality is that these parts, although closely machined, are often not perfectly machined, and handling, shipping, and other abuses in your hardware store, vendor shelves, and bouncing around in my truck all contribute to nicks, and flaws that can allow fluid at a 1000 psi to sneak through, and so these materials are sealants also. Lets now take a look at some of the options. Ladies, and gentlemen, in the far corner, weighing in at next to nothing is Teflon Tape. He's pretty, snowy white, the reigning champion, and ready to fight. In the other corner, also weighing in at nearly nothing is TFE Goo. He's messy, not pretty, but has a long record of knock outs. Lets make it a clean fight, especially you Goo. We are now off to the very top secret Parmain laboratory to do some empirical analysis of the sealing options. 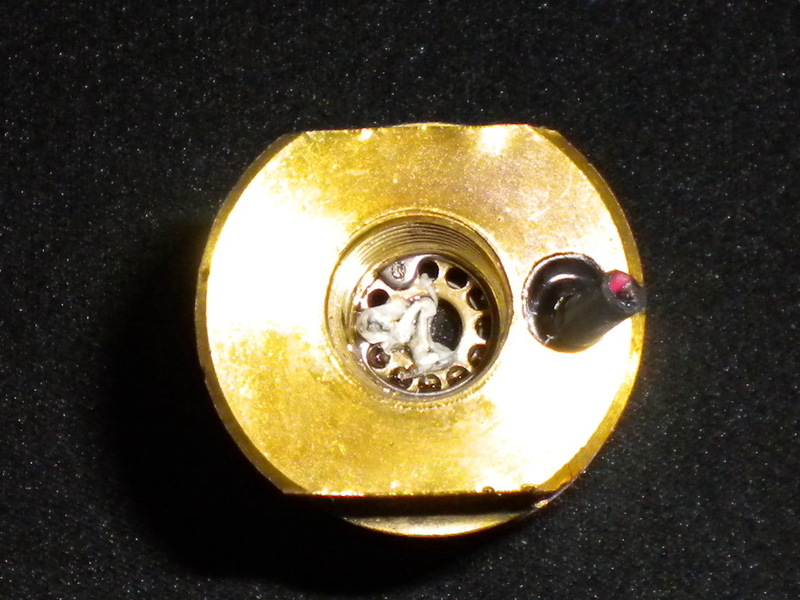 Below is an example of the culprit that mucked up our Garmin shadow drive sensor, and an example of how not to apply teflon tape to pipe threads. When the tape is applied below the starting threads, the threads can cut off the lower tape, and allow it to enter the hydraulic system. I screwed that fitting in, and then screwed it out, and you can clearly see what happened. The threads did cut off the excess tape, which will migrate into the hydraulic system, mucking things up, as it did in the shadow drive. If you use teflon tape, this is what it should look like. You must keep the tape clear of the lower threads. 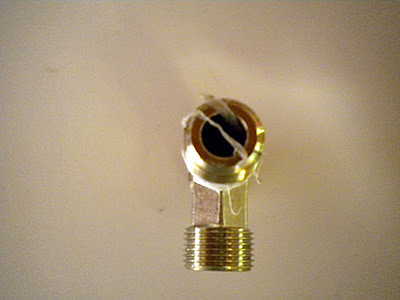 When this fitting was screwed in, and then screwed out, it came out cleanly, with no tape left behind. Using the goo, you can actually encounter the same problems you have with teflon tape By getting goo down on the lower threads, the same thing happens. 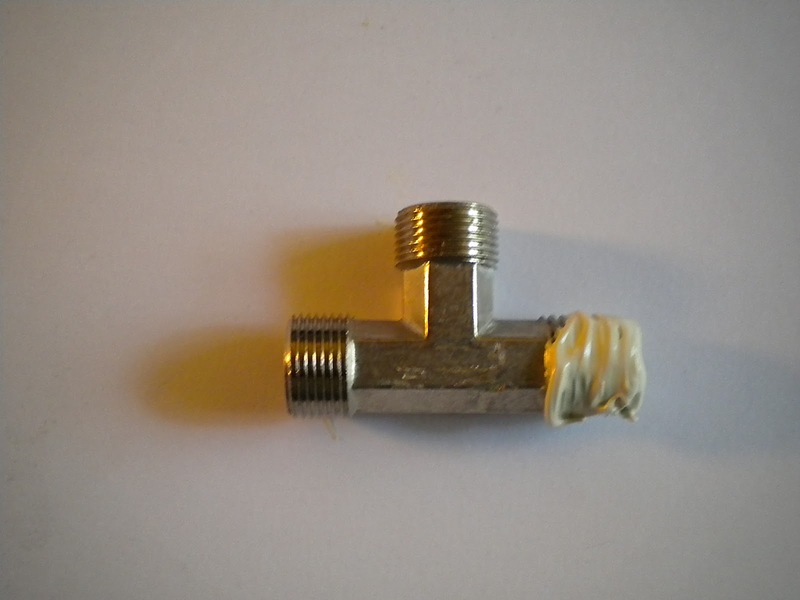 The goo ends up on top of the fitting, allowing it to also get into the hydraulic system with the same ill effects. I did overplay the amount of goo used to illustrate the point, but it is not easy to apply it from the tube directly. Below is the a picture of that same fitting screwed in, and then backed out, and you can see the excess goo hanging off the end of the fitting. I mentioned in the beginning, that I have mixed emotions about all of these sealing products. They all have some pluses and minuses, and there is a huge number of products to chose from. They all have one thing in common, and that is proper application techniques. 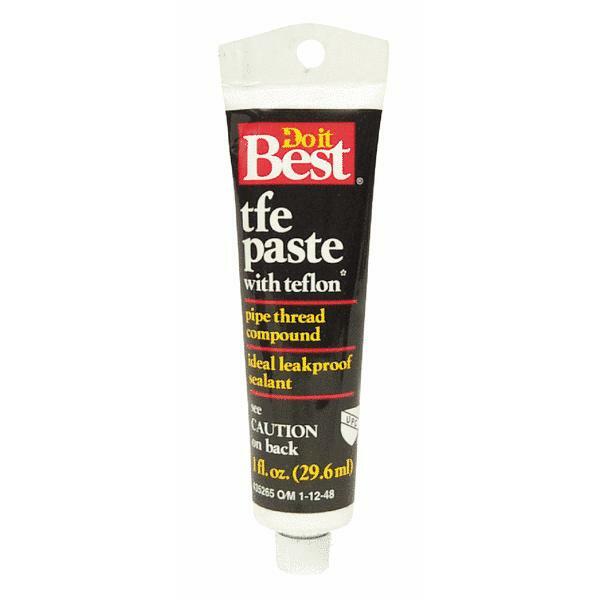 I'm not a fan of TFE paste. Yes it works well when properly used, but it can be messy. The products sold in tubes are hard to apply on the small fittings you see above, and many of them need some curing time to become truly effective. The second problem I have with the pastes, is despite the claims of many that they don't harden, they do. 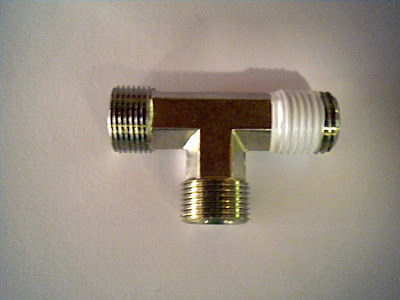 I know this because when I install an autopilot on a ten year old boat, that has been baking in the Florida sun, I have to often unscrew the 90 degree fittings off of the back of the helm pump, and replace them with tees. The TFE paste is often very hard, and brittle, and little chunks break free, and can fall into the helm pump if you are not very careful. The products that come in the cans with a brush, have brushes that are designed for larger household plumbing pipes, so you often need a smaller brush to apply it. Truth be told, I would rather use teflon tape, than TFE paste anytime. Properly applied it works well, it isn't messy, but I suspect that companies like Teleflex have a long history of dealing with poorly applied teflon tape, and less issues overall with the paste products, and that is why they recommend that or other products. There are a couple of liabilities with the tape. You must wrap it in the right direction (looking at the fitting with threads down, you go counter clockwise), and you have a high probability of leaks, if you back the fitting off, even a little bit during installation. Nothing is perfect in life, and often we have more options than we would like. It would be nice if there was only one solution available. We could grumble about it, but couldn't do anything about it, but this is not the case. Below is my current favorite. It is a purple colored liquid, and has a thin nozzle applicator, that makes it easier to apply to smaller fittings. 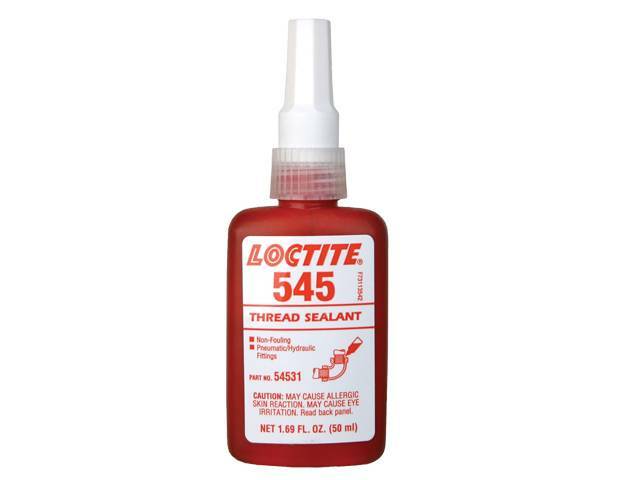 Loctite makes many products that are similar, but avoid the products that are also thread lockers, if you ever want to get that part back off in a dark very cramped place. 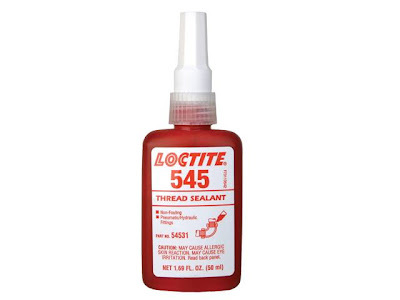 This product, although it works very well, also has a tenacious death grip on the threads, and under some scenarios you may need a heat gun to expedite removal. If I run out of it, I always have the tape (sorry Marc). TFE Goo did win the fight, and Teflon Tape is still trying to wash it all off in the shower. If you have any better suggestions, edify all us with the comment box below. 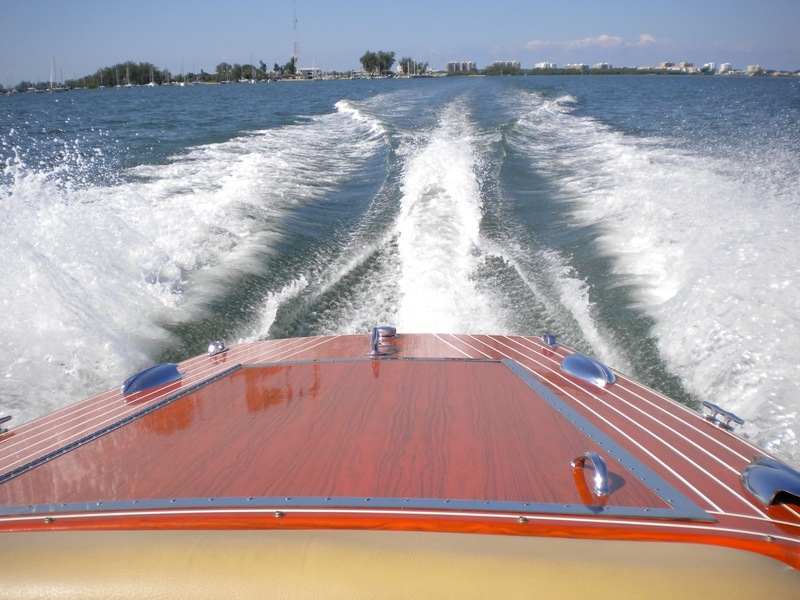 It was a lovely Friday morning, and Sandy called me to go play on Sarasota Bay with the new trim tabs on the Elite Craft. It really is a beautiful boat, wood-esque appearing, without the the struggle of maintaining real wood, and boy does it turn heads when your'e out on the water. As the fork truck was taking the boat to the water, I snapped a shot of her undersides. She has a moderate vee hull entry at the bow that carries back, and transitions into a small flat pad aft at the rudder, and prop. With no hull strakes, I sensed that it could be a little slippery in the water, and why the back end might have a tendency to slide out doing aggressive turns, or while encountering larger boat wakes. She runs bow high until planning off, and then the bow drops, and she flattens right out. One of Sandy's complaints was when planning flat in a light chop, you get spray over the bow, and I experienced some of this during our excursion. It also has a bit of a bottom slapping feel when crossing larger boat wakes at speed, but the comfortable, and thick cushions take some of the sting out of this. The tabs worked very well, and the ability to pick up the bow a bit in a moderate chop dramatically reduced the amount of spray that came over the bow. "The handling is much more stable! Turning feels more solid, and predictable, and the boat just seems to resist tilting over anymore. You really have to move some weight around now and then only one or two clicks corrects it, and holds it. It no longer swaps lanes in the ICW when encountering wakes. Rather now it stays the course and holds its heading much better. You can scrub off speed just like an I/O, and you feel her dry off, pick up rpms, and move out steadily under high speed as the tabs are lifted. Pretty hard to achieve without the tabs, more like "impossible". 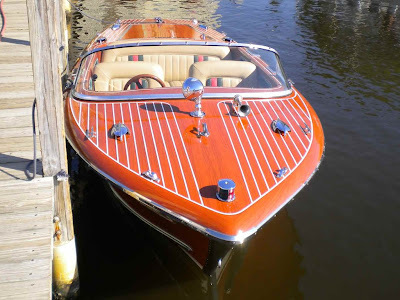 "The boat is much dryer, (which is not easy to accomplish) and overall a pleasure to drive now, whereas before I was considering not keeping it. Now she runs as good as she looks, and it feels like a 20 foot plus boat. I am ecstatically happy with her now! I am scrapping the big block idea in favor of a seriously warmed over small block, for simplicity and weight, cooling etc.. and now I think she take a few more mph with ease." Even though I had not experienced the boat prior to the trim tab installation, the boat felt good to me. We did a couple of very sharp high speed (25 kts) turns, and the back end felt very stable. I also suspect that the additional outboard support given by the tabs, made the boat a little more stable, especially at speed. It's such a pretty boat, I want one.